But then something happened. The often-hysterical Ahmedinejad was replaced by a modest-looking moderate, Hassan Rouhani, who interestingly enough was elected to power, like Ahmedinejad but the similarities stop there. In Israeli eyes, at least the blinkered sight of Netanyahu nothing has changed. The sly, devious, primitive Persians have fooled the whole world again. They did this to go on building their bomb, but the excruciatingly naïve Obama wants to believe their lies. Even more time will be lost. So Iran bombing is back on the agenda and more urgent than ever. There is no alternative. David and Cyrus both had sizable or large empires. Both their imperial domains at one stage, in the distant past were also subject parts of the Median Empire – of the Kurds – whose capital was Ectabana, about mid-way between Tehran and the present Iran/Iraq frontier. Both Israel and Iran have had a long experience of European colonial adventures, and especially the latter-day oil hungry American imperium, which the war weary American people have had enough of and can't afford. Mutually assured destruction exists, also, in Persian-invented chess but this is only a quick way to end the game, for the impatient and the clumsy. Iran's leaders are a cautious and thoughtful lot. Since the Islamic Republic was founded in 1979, they have never attacked their neighbors - the eight-year war with Iraq was started by the reckless Saddam Hussein. Possibly with American and Saudi incitation. Certainly for nothing at all but massive loss to both sides. It is probably fair to say Iran wants another war as much as it wants an A-bomb. Another probability is that Iran's bomb program is a self-defence reaction and response to constant baying and threats from Israel's right wing leaderships, over the decades, and the war-hunger of neo-conservative warlords in Washington, most of them Zionist Jews. For this war-starved clique, Iran bombing is always on the menu. They are devoid of any other theme. Media shock and awe, this week, that Rouhani at the UN building declined to shake hands with Obama in a “photo op” could be a natural Iranian bazaar trading ploy. Being natural traders, the Iranians may give up the bomb in return for the lifting of all sanctions, trade guarantees, financial and technical aid for the flagging economy, and a list of other want-its. This is why the Supreme Leader Khamenei selected Rouhani and the people voted for him. As a self-defence nuclear weapon, its large Bushehr nuclear complex is already a massive Dirty Bomb. 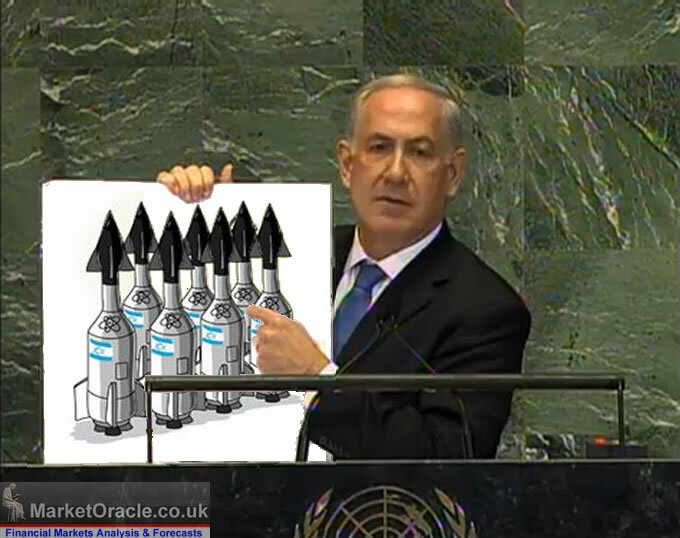 The simplest question is: Why would Iran want an offensive atom weapon? Old enemies, or new ones, can be transformed into friends and allies. One positive development from the Syrian crisis is clear. The US of Obama and Russia of Putin discovered that they can work together in the critical areas of preventing massive loss of life in Syria when or if its chemical weapons are no longer controlled, and preventing the armed rabble of djihadi gangstahs from crippling the country for years ahead in pure mayhem and anarchy. Putting a lid on Syria, the opponents in the civil war may get tired of massacring each other and agree to a political solution. Obama and Hollande also learned the lesson they need to learn - holding on to the primitive belief that the only solution for any problem is the use of naked force, like they do, is a guarantee of more and larger wars in the future. Iran's deliberate extreme low profile in the Syrian civil war, to be sure not abandoning al-Assad's fellow shia regime, is another proof that Iran is not a threat to the West, to civilization, and to the world. Anything at all to do with Iran's nuclear program, civil or supposed military, always cycles back to Israel and the Holocaust. Mr. Rouhani, in an interview on Tuesday 24 September with CNN, described the Holocaust as a “crime that the Nazis committed towards the Jews”, calling it “reprehensible and condemnable.” His predecessor Mahmoud Ahmadinejad had denied the systematic extermination of Jews during World War II. 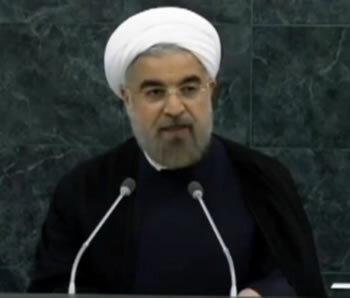 Immediately after his translated remarks, controversy hit the fan, with Benyamin Netanyahu reliably saying Rouhani is “a wolf in sheep's clothing”. For the bomb Iran crowd anything that tends to deflect attention from Iran's nuclear weapons potential – to Israel's large arsenal of functional nuclear weapons – is a “cheap diversionary tactic”. This double standard is explained as being due to Israel's “unique security situation”, itself a racist euphemism. Interviewed by Huff Post, 26 September, the Israeli nuclear arms expert Shlomo Aronson put it more simply: “In today's power relations, where there are 6 million Jews against 400 million Arabs ... Israel has no choice but to be an undeclared nuclear power”. He didn't mention Iran's 75 million population. In 1986, Mordechai Vanunu, a disgruntled technician at Israel's “secret” nuclear weapons centre, the Dimona facility, handed photos of the facility to a British newspaper leading foreign experts to conclude that Israel already had the world's sixth-largest nuclear arsenal. Israeli agents later seized Vanunu in Rome, and he spent 18 years in prison. One high potential diplomatic victory for Iran, if it accepts to prevent its nuclear program having “threshold weapons capability”, will be the rising tide of demands that Israel declares its nuclear weapons arsenal – instead or refusing to admit or to deny it holds the weapons – currently estimated at about 80 warheads. The Iran nuclear crisis is antique – although not as old as Israel's nuclear weapons program which dates back to the early 1960s. Other business on the agenda is urgent, or very urgent. The Middle East and wider MENA region is literally a barrel of gunpowder ready to explode, or already doing so. Both Iran and Israel have highly special relations with the Arabs, certainly including hostility and suspicion, and war. Never admitted by the Arab nations, they have a large number of cultural or philosophical dependencies on, and linkages with Persian and Jewish civilization. Following Arab Spring revolts starting in 2011, the Arab world has gone into accelerated instability, making it less likely than ever that Arab countries would attack Israel – formally. Djihadi fanatic attacks on Israel are conversely even more likely today, than previous. Attempts by Saudi Arabia to foment war with Iran, to cause a “replay and remake” of the 1980-88 Iran-Iraq war are taken at least as seriously by Iran as the threat from Israel's war clique and its Washington Zionist lobby allies. The war focus completely sidelines all other urgent business, ranging right across the social and economic spectrum, which concerns the region. In the Arab Spring revolt the seemingly permanent rule by Western-approved dictators, princes and potentates is either terminated, or under threat. In Iran, the country has started moving on from the often-hysterical Ahmedinejad era, and has much more serious issues to deal with, which do not include nuclear weapons. Israel urgently needs to do the same thing, act civilized and deal with Iran constructively, before it is too late.